Editors: Meece, Judith L. and Eccles, Jacquelynne S.
Children spend more time in school than in any social institution outside the home. And schools probably exert more influence on children's development and life chances than any environment beyond the home and neighbourhood. 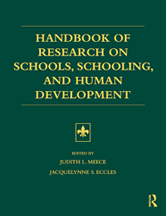 The purpose of this book is to document some important ways schools influence children's development and to describe various models and methods for studying schooling effects.